Join us and our adorable adoptables on Saturday April 27th from 12 pm to 2 pm at the Beaches Pet Valu! Meet our available dogs and find out how you can get involved with the Coveted Canines Crew! Join us and our adorable adoptables on Sunday April 28th from 12 pm to 2 pm at the Yonge and St. Clair Pet Valu! Meet our available dogs and find out how you can get involved with the Coveted Canines Crew! Join us and our adorable adoptables on Sunday April 28th from 12 pm to 2 pm at the Leaside Pet Valu! Meet our available dogs and find out how you can get involved with the Coveted Canines Crew! Join us and our adorable adoptables on Saturday October 12th from 12 pm to 2 pm at the Beaches Pet Valu! Meet our available dogs and find out how you can get involved with the Coveted Canines Crew! Join us and our adorable adoptables on Sunday October 13th from 12 pm to 2 pm at the Leaside Pet Valu! Meet our available dogs and find out how you can get involved with the Coveted Canines Crew! Join us and our adorable adoptables on Sunday February 17th from 12 pm to 2 pm at the Leaside Pet Valu! Meet our available dogs and find out how you can get involved with the Coveted Canines Crew! Join us and our adorable adoptables on Sunday February 17th from 12 pm to 2 pm at the Beaches Pet Valu! Meet our available dogs and find out how you can get involved with the Coveted Canines Crew! Join us and our adorable adoptables on Saturday February 16th from 12 pm to 2 pm at the Beaches Pet Valu! Meet our available dogs and find out how you can get involved with the Coveted Canines Crew! T’is the season to twin! Join us at the CESAR® Holiday Portrait Pop-Up. Snap a pic of you and your pooch in matching sweaters and take home a custom holiday card. Come visit and help us support dog rescue Coveted Canines. For a small donation you can take home a sweater set of your own. There’s a limited number available – so grab them while you can! Join us and our adorable adoptables on Sunday April 22nd from 12 pm to 3 pm at the Leaside Pet Valu! Meet our available dogs and find out how you can get involved with the Coveted Canines Crew! Join us and our adorable adoptables on Saturday April 21st from 12 pm to 3 pm at the Beaches Pet Valu! Meet our available dogs and find out how you can get involved with the Coveted Canines Crew! Join us and our adorable adoptables on Sunday February 11th from 12 pm to 3 pm at the Leaside Pet Valu! Meet our available dogs and find out how you can get involved with the Coveted Canines Crew! Join us and our adorable adoptables on Saturday February 10th from 12 pm to 3 pm at the Beaches Pet Valu! Meet our available dogs and find out how you can get involved with the Coveted Canines Crew! Join us and our adorable adoptables on Saturday January 20th from 11 am to 2 pm at Wooftown across from Summerhill Station! Meet our available dogs and find out how you can get involved with the Coveted Canines Crew! Join us on Sunday, December 17th, from 12 to 5, for an Adoption Day & Christmas Market at Big Al’s in Scarborough! - Meet our available adoptable dogs! - Visit our “Fill Your Own Doggy Stocking" station where you’ll be able to pick out over $50 worth of product and create the paw-fect gift for your pup this season for only $25! - Learn more about adopting, fostering, and volunteering! 100% of the proceeds from the event will go directly to helping rescue and rehome more dogs in need. Come meet our adoptable dogs! Each year Equinox throws a winter fair to raise money for the school and offer local artisans and organizations a venue to introduce themselves and build their community. This year the fair is on December 3rd and the Artisan Market runs from 11-3. We expect between 300 and 400 people to attend. Many parents in our community are looking to add furry family members but don’t always think of, or are not aware of small rescues. Coveted Canines is excited to be a part of this local, community-driven event! Join us for a night full of laughter to benefit CCR and all the pups that need rescuing! Meet the puppies at Mona’s puppy PAWTY this Saturday October 28th! Hello! I’m Bear! I’m the oldest and therefore wisest pup around! I like to sit back and contemplate life. My foster mom says I look like a tough puppy because my ears stick straight up but really I’m a softy. I love cuddling and nibbling on toes. They call me Bandit because I’m going to steal your heart! I’m big bruiser of a puppy but I sure do love snuggling! I’m a little quieter than some of my brothers and sisters but that’s because I’m a gentleman and I’ll wait my turn to be picked up for snuggles. Well, hello there! Am I not just the most handsome puppy you ever did see? 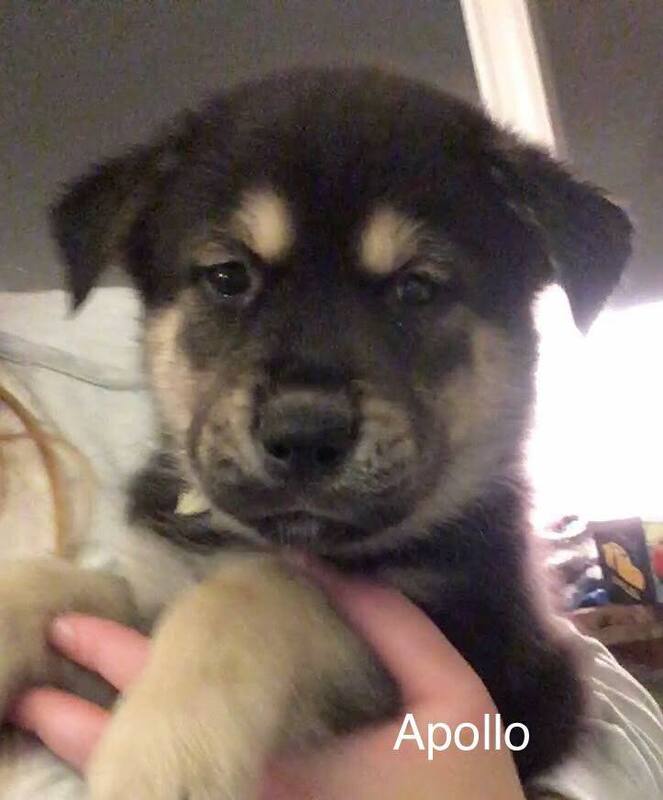 I’m Apollo and I LOVE to cuddle! Some might even say I’m the most cuddly puppy ever! I’m also asking my foster mom and give me kisses and in turn I give her lots too! Hello, my name is Astro but some say I bear a striking resemblance to a certain rock star named David Bowie. I’m not sure why though! I love to give kisses and I’m always the first one at the gate to greet my foster mom in the morning. Coffee?! COFFEE?! Did someone say coffee?! Oh, no? I guess snuggles will just have to do! I’m Java and I love running around!! I these cute floppy ears and big brown eyes, and I’m looking for someone who likes snuggles and occasional puppy nibbles! Is that you?! Did I hear someone is looking for a god amongst puppies? Well, you’ve found him! I’m Zeus and I’m a very nice and laid back puppy. I like to give kisses and play with my siblings, when we play I always win because I’m so strong! Ooooo! Do you want to cuddle?! I LOVE cuddling!!! I’m Star and it can be hard for me to get all the snuggles I need with all of these brothers around here! They’re bigger and bossier than I am so sometimes I need to be extra loud so I can get my point across. I like everyone and everything and I think I’d love you too! 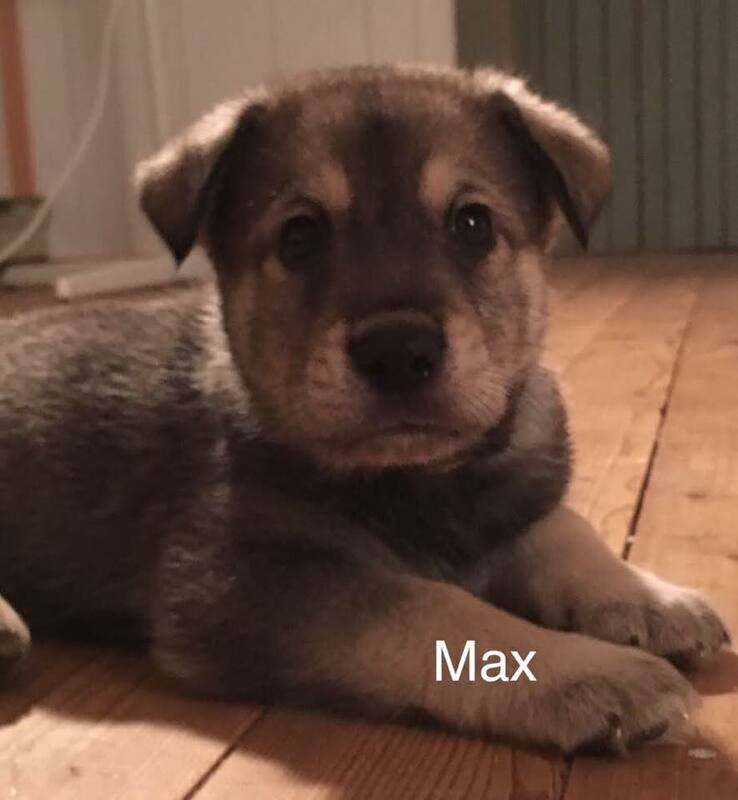 Hey I’m Max, or as my foster mom calls me “Stop-It!”. I love sitting on laps and watching TV but my real passion lays in biting ankles and spilling water dishes as soon and they’re filled. It’s really fun to watch my foster mom run across the room to clean up my messes, she’s getting pretty quick! With my help, she could be the fastest! If you’re looking to sharpen your cleaning skills we may be a match made in heaven! Adoption Event @ Dogfather & Co.
Purina PawsWay will be holding a bake sale with all proceeds going to Coveted Canines Rescue. Join us and our adorable adoptables at Big Al's Scarborough location! Meet our available dogs and find out how you can get involved with the Coveted Canines Crew! Join us and our adorable adoptables on Sunday April 23rd from 11 am to 2 pm at the Leaside Pet Valu! Meet our available dogs and find out how you can get involved with the Coveted Canines Crew! Join us and our adorable adoptables on Saturday April 22nd from 11 am to 2 pm at the Beaches Pet Valu! Meet our available dogs and find out how you can get involved with the Coveted Canines Crew! Empire Comedy Live presents Comedy with Benefits, Saturday March 4th at Second City’s John Candy Box Theatre. Join us and our adorable adoptables on Sunday February 12th from 11 am to 2 pm at the Leaside Pet Valu! Meet our available dogs and find out how you can get involved with the Coveted Canines Crew! Join us and our adorable adoptables on Saturday February 11th from 11 am to 2 pm at the Beaches Pet Valu! Meet our available dogs and find out how you can get involved with the Coveted Canines Crew! Coveted Canines will have a booth at this year's Toronto Christmas Pet Show. Stop by and see us! For more info visit http://www.torontochristmaspetshow.ca. It's the 3rd annual Redemption Dogs parade! Come get your photo taken, raise awareness for homeless dogs and enter the Redemption Dogs Halloween Costume Contest! We will be parading down and around Queen St West with dogs in costumes (bonus if you dress up too) holding signs on how people can help homeless dogs. We hope to make a bold and adorable statement reminding people that as the winter months ensue there are many ways people can help dogs. Don't have a dog? Come and walk in costume or just watch. Don't have a rescue dog? This event is open to all dogs from every walk of life. Starts at 1:00pm sharp (Graffiti Alley at Queen and Portland), show up and flaunt your stuff. PRIZES FROM: All Good Dog Food Co. , Earth Rated and Peachy Keen Pets ! We will have an awesome team of judges! Stay tuned! Come meet CCR's currently adoptable dogs, and ask us any questions you have about fostering, adopting, and our organization. Coveted Canines is a not for profit organization that rescues dogs that are at high risk of being euthanized and are vulnerable to abuse. We are run wholly run by unpaid volunteers who donate their time and expertise for the love of dogs.